Salanga has been active since 2007 and was created by group of people with experience in various social, academic and technical sectors with a goal to provide training to NGOs. Since then, the team, portfolio and reach have grown and Salanga is now recognized by donors and organizations around the world. Our vision is a world where civil society and non-profit organizations from humanitarian, international development, social and environmental sectors are confident, professional and working in efficient, universally beneficial partnerships with each other, public and private sectors and local communities. Our role is to contribute to sustainable, community-centered collaboration. Salanga delivers training, consultancy, and support to organizations that address poverty, malnutrition, health issues, social exclusion and the effects of climate change impacting communities and individuals around the world. We believe in true partnerships and aim to guide our partner organizations to achieve their goals, preserve their principles and become stronger and more accountable to their target communities and donors. We believe that any organization can effectively measure its impact and deliver high-quality results while keeping their employees safe. It is a constant journey for all organizations, regardless of their size or location, and we are proud to join them on this journey – to help promote best practices, share lessons learned and uphold ethical principles in their work. But now, Salanga focuses on much more than security issues, right? “Through our engagement with aid workers, we realized that non-profit organizations have other challenges too – such as how to measure the impact of projects, how to ensure projects are sustainable and using best practices, and how to secure funding from donors. This led us to create Salanga’s current three programs and really allowed our team to grow and engage individuals with high-quality technical expertise. We also decided to create our own tool for monitoring and evaluation, Kinaki, to help simplify the process for our clients. From an interview with Salanga’s co-founder, Jakub Nemec. 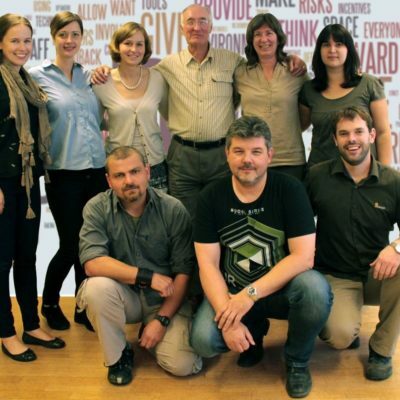 Our team is international and multicultural, consisting of core staff and external colleagues from Czech Republic, Canada, Australia, Rwanda, and Mongolia. We operate from two main offices in Ottawa, Canada and Pilsen, Czech Republic, with team members based around the world. Due to the nature of our work we do our best to remain connected and accessible to our global organizational partners wherever they may be based. Jakub has worked in the field of international development and humanitarian aid for over a decade. In 2007 he founded Salanga. He is a practitioner at heart and draws on his experience to support Salanga’s partners in everything from program design to safety and security. Jakub understands the many demands and challenging contexts facing our partners, he ensures that Salanga is always providing customized and high quality support. Paula brings 10+ years experience designing, managing and evaluating complex food security and sustainable economic development projects in Africa, Asia and the Caribbean. She has a passion for using data to make a difference in decision-making and is inspired by MEL systems that catalyze learning and promote knowledge sharing from the ground up. Martina has a unique combination of work experience with humanitarian and development NGOs, the UN and the IT business sector. Martina’s eye for detail, sharp mind, and ability to see the whole picture ensures the smooth running of Salanga and its programs. Christina has worked for international development and social service organizations in Canada and overseas. Christina works on our monitoring, evaluation and learning tool, Kinaki. Having worked with many project coordinators, managers and directors, Christina understands the common struggle to produce quality, accurate and timely reports. She is passionate about finding ways to make data collection, analysis and reporting more efficient for Salanga’s partner organizations. Petra is a PhD candidate, has worked for University Development Cooperation and has knowledge of MEL within EU programming. She is a MEL enthusiast with exceptional skills in qualitative and participatory research and monitoring techniques. She is an experienced trainer of trainers for Focus Groups, Key Informant Interviews, and Mobile Data Collection, having delivered training for teams and individuals around the world. Drawing on her experience, Petra handles the area of setting-up and managing effective systems to support the MEL needs of our partners. Tomas has many years of experience in the area of search and rescue, security and first aid. He is our leading expert in the field of Safety & Security. He helps conduct seminars and pre-deployment training for aid workers and international volunteers. He also provides security consulting to our partners in the field. David has worked on survey data collection in multiple countries. He has experience with setting up data collection systems and brings expertise in survey design, methodology and statistics.